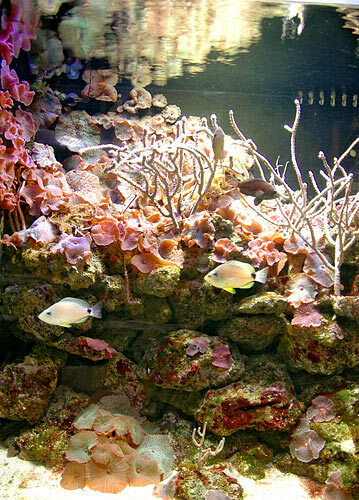 The Key West Aquarium is Key West’s first attraction and was built by the WPA during the Depression. The facility took two years to complete and opened on February 18, 1935. It was the first aquarium in the world to use the open air concept allowing for natural sunlight to illuminate the concrete marine displays. 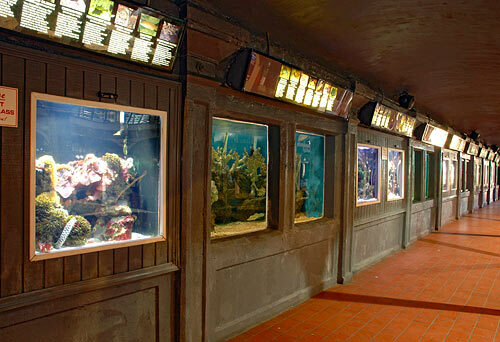 One of its original purposes was a marine repository for other aquariums from around the country. 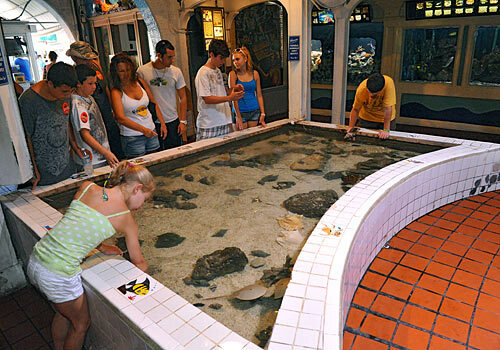 In 1943 the US Government leased the Key West Aquarium to the Navy, Marine Corps and Coast Guard who used it as a rifle range. 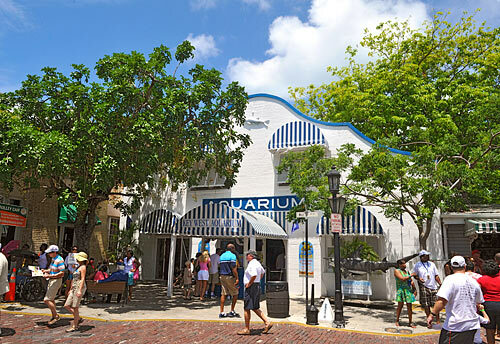 In 1946 the Aquarium was returned to the city of Key West and restored to its former glory. In the 1960's the roof was added to the once opened air aquarium to cut down on algae in the exhibits. More modern methods of illuminating the tanks were slowly being developed and with it came the end of the open air aquarium. 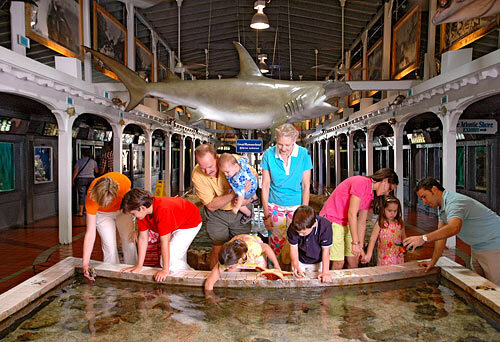 Today, the Key West Aquarium is home to sharks, turtles, stingrays, tropical and other various fish found in the beautiful waters of Key West. 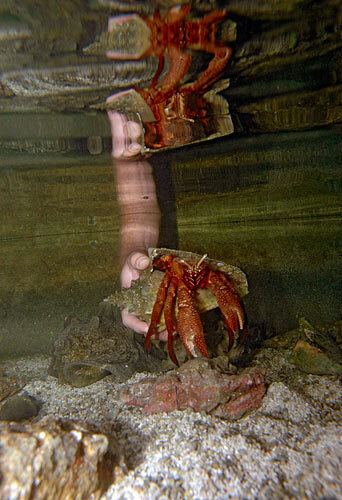 It is actively involved in conservation of the delicate eco- system of the Florida Keys. Operating Times: Daily. 10 am to 6 pm - 365 days a year. Parking: Parking is available at Mallory Square or The Westin Parking garage. Age Requirements: Children prices are ages 4-12 yrs. of age. Children 3 yrs. and younger are free. 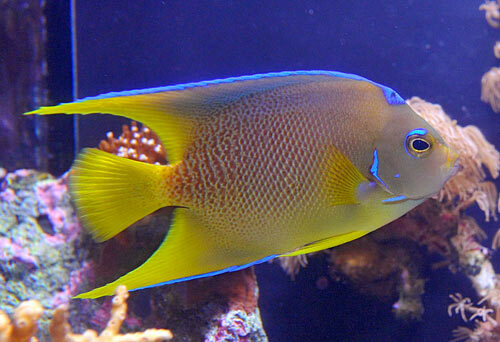 Have you been to Key West Aquarium? Share your knowledge and be the first to review this. "Small Aquarium...Just a short visit"
The aquarium was rather small but had two large indoor tanks with stingrays & shark and a hands-on touching area. 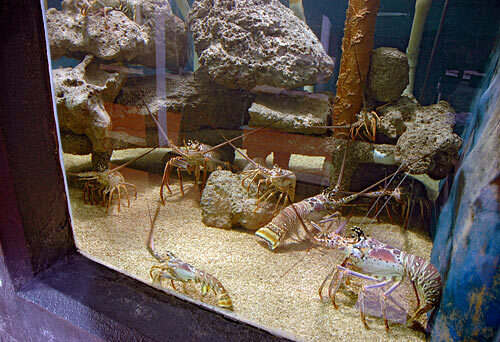 There were several dozen smaller indoor viewing aquariums with a variety of fish & crustaceans. Outdoor there were huge turtles, but it looked like renovations were in progress. We spent less than 60 minutes here. We’ve been to a number of larger aquariums, so ok but not a “must see”. There are a number of programs & feedings offered throughout the day. "A good aquarium for learning about sea turtles"
First off, they have no public bathrooms, which is very difficult for a place that caters to children. The aquarium is small, but I felt good about supporting it, so I wasn't disappointed in our visit. The keepers are informative, and I did learn about the 5 sea turtles they have in their care. Good for small children, but not much see. "Perfect size aquarium for the location"
We have visited a lot of aquariums, have a large one in our home town, and always go to them when we can. If you’re looking for an aquarium that rivals Monterey, Atlanta, and so on this is not the place. However if you’re looking for a nice place to see fish, sharks, local fish, rays, and get some education about the local waters this is the place. Staff is awesome, easy to navigate, have programs often and dog friendly. Great stop, can spend about an hour there and with it being the first tourist attraction ever in Key West it’s historic. Easily the smallest aquarium I’ve ever been to. It’s basically just two areas. However, I will say we were glad we went as my husband and I really love zoos and aquariums. The interior is really cool with the dim blue lighting and the massive sharks hanging from the ceiling. The animals they had were also pretty neat to see. It was a fun way to kill 30 minutes, but you can skip it if you don’t have a lot of time to see Key West. We enjoyed our visit here. It is NOT a large aquarium. There are some tanks in a room inside, some larger fish outside, and a few injured turtles out back. Everything there is very well displayed, but it did not take us very long to see everything. The staff were very friendly and helpful. 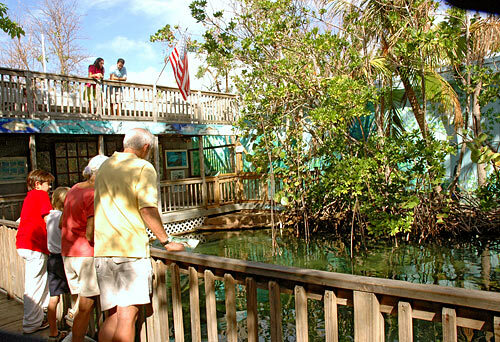 This is a nice, relaxing place to get away from the bustle of Key West, but it does not take very long to see everything. 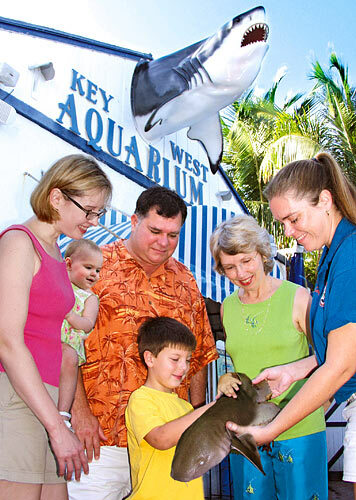 The Key West Aquarium is located on the world famous Mallory Square, home of the nightly Sunset Celebration. We are at the corner of Front St. and Whitehead St. in historic Old Town Key West. Our address is #1 Whitehead Street, Key West, FL 33040. Parking can be difficult in Old Town. However, there is plenty of metered parking on several blocks around Mallory Square. There is a parking garage at the Westin Resort one block over. There is also a Park and Ride garage located on the corner of Caroline and Grinnell Street where you can park and use the city bus to get downtown. What do you do during the guided tours and feedings? 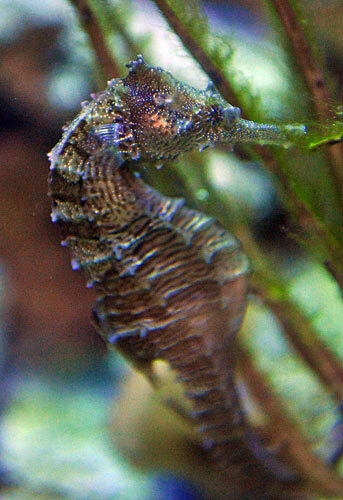 Our guided tours and feedings are 30 to 40 minute walking tours of the aquarium. It is led by our guide that feeds many marine animals while educating our guests with interesting facts and the history of Key West. Can I take photographs and/or video? Absolutely. Photographs and video are always welcome. How much time should I expect to spend in the aquarium? The average time our guests spend at once is 45 minutes to an hour. How large is the aquarium? 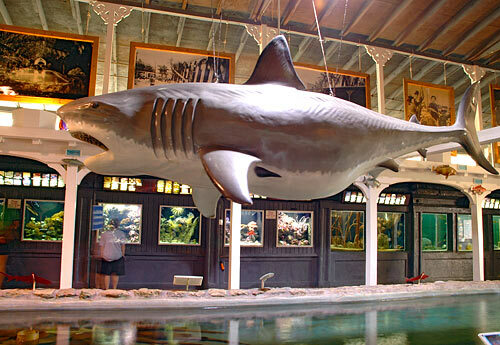 Since the aquarium was first opened in 1935, it is a smaller, historical aquarium. It is one story and is wheelchair accessible. No. 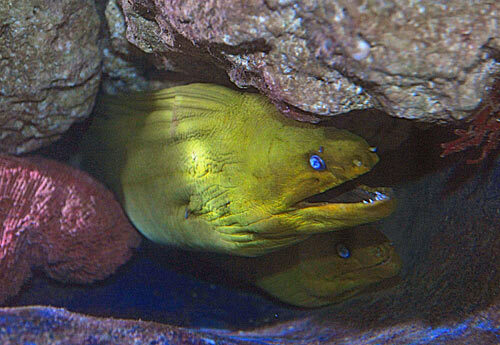 The aquarium is open 7 days a week, 365 days a year. We reserve the right to close early should special circumstances arise. We immediately inform our guests if there is any change in operation hours. Yes! Dogs are welcome anytime as long as they are on leashes. The aquarium reserves the right to request the removal of any animal displaying aggressive behavior or for excessive noise. Can I bring drinks and food inside? Yes, food and drinks are allowed inside the Aquarium.